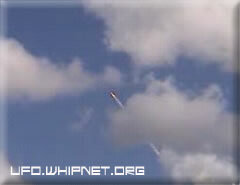 Space Shuttle Discovery Launch with UFO Observer. 3 of my favorite things: July 4th holiday, Space Shuttle launches and UFO's. This video recorded last independence day has them all. It starts out filming the July 4th launch of the Discovery Space Shuttle launch. A normal launch with no problems. You follow it until it cuts main engines and disappears behind a cloud. The video then breaks and you see what appears to be a round object floating around clouds around the area that the space shuttle launched from. At first it seems it could be a balloon, but after a few moments pass, the object has not drifted off and you can clearly see it maneuvering in all directions. It seems to be playing a game with the cloud darting in and out of it. I can't say with any certainty that this is an alien craft, but the object is certainly there and unidentified. From photographer: I filmed the Space shuttle Discovery launching from Cape Canaveral on July 4, 2006. The launch was good, but then I noticed a black dot hovering below where the shuttle went up, and I turned my camera back on. It was a round black dot that hovered, changed direction, lowered quickly, and moved in and out of the clouds. The logical explanations for this UFO don't work out for me. Could it be from space, watching us humans go into space?